Trying a new recipe is the perfect way to occupy a lazy Saturday afternoon. 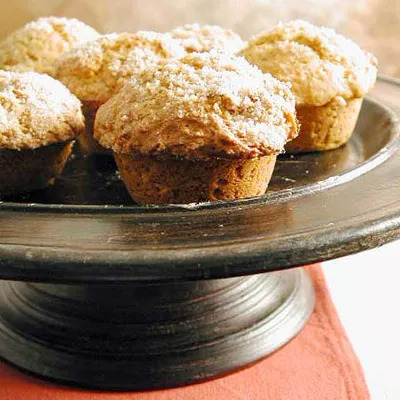 These muffins are spicy, sweet, and less than 200 calories each (164 to be exact!) Plus, one batch makes 24 muffins, so you can either share the love or freeze the leftovers. They'll make an awesome grab-and-go breakfast option when the week gets crazy. On crisp, October afternoons, it’s easy to feel obliged to get outside and do something that screams 'fall.' We’d be willing to bet that your Instragram feed will be overloaded with plaid shirts, apple orchards, and new leather boots this weekend. But if you’re really just feeling a weekend at home, conquer those seasonal ambitions in the kitchen! So go ahead and stay inside, there’s nothing more autumnal than the smell of pumpkin wafting from the oven.